A radical approach to the annual problem of kids and the Halloween candy haul: let them eat it. What To Do With the Halloween Candy? Eat It. 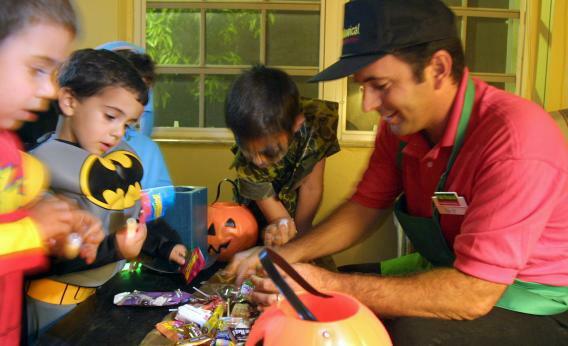 With the approach of Halloween comes annual onslaught of parenting anxiety provoking articles on the question of “What to do with the Halloween candy?” Approaches to the bucket of sugary goodness are varied. The Washington Post’s excellent parenting blogger, Janice D’Arcy, has an expert dishing up many of them today: trade the candy for a toy. Allow your kids to enjoy “a few favorites” and then tuck the rest away. On the Huffington Post, the advice is for dieting parents, but it’s similar: let them eat some, “donate” the rest. The Kansas City Star adds some fun ideas about reading the nutrition facts on the back of the bars together and using Halloween as an opportunity to talk about “healthy and not-so-healthy foods.” No one supports super-restriction. Let kids “indulge a bit” is the preferred advice. Because that’s a lot of candy. Clearly we have to do something. I have a radical suggestion. How about we let them eat it? I have my rants about candy, too. It’s so cheap that it’s ubiquitous. Its presence everywhere reinforces the idea, common among small children in particular, that if you are not actively doing something else, you should be eating at all times: Goldfish in your stroller, snack time in the middle of the two entire hours you spend at preschool, Pirate Booty in your car seat. I’m tired of the inevitable candy-filled goody bag that comes home from birthday parties, and I really should not get started on pinatas. But it’s Halloween. And Halloween is about dressing up in spooky costumes and being given candy. There is no tradition that’s been set aside in favor of the emphasis on candy, no requirement that we “remember the reason for the season,” no need for bemoaning the horrible commercialization of the whole thing. That’s it. That’s all there’s ever been to it, from the days of old when you carried a turnip lamp over to the neighbors, uphill, both ways, in order to beg for cakes. So can we please just not worry about the candy? I have even had a dentist tell me that he would rather the kids just ate it all at once, on the theory that then it’s “one sugar event” for the teeth instead of, say, one a night throughout November. I know there’s a lot of it. I know you have that one neighbor who gives out King Size candy bars. And that Tuesday morning will find your child eating candy for breakfast. But in the long run, what’s the absolute worst thing that will happen if you let the kid eat every single thing out of the bucket that he or she wanted, whenever she wanted it? Dare to find out.